The SuperSonix®-NG PCIe hard drive duplicator is the only portable/hand-held hard drive cloner on the market that supports PCIe M.2 SSDs including AHCI & NVMe types! The SuperSonix-NG-P delivers blazing fast hard drive cloning at 24GB/min* and efficiently performs hard drive duplicating tasks including PC deployments, O/S upgrades, content/application distribution and data back-up tasks. 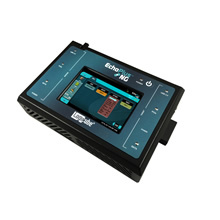 It’s compact size makes it ideal for the workbench or mobile on-site applications. The SuperSonix-NG PCIe includes 1 PCIe, 2 SATA and 1 USB 3.0 master port and 1 PCIe, 2 SATA and 1 USB 3.0 target port. High-Speed DuplicationThe SuperSonix-NG-P hard drive duplicator will clone at blazing speeds of 24GB/min*. 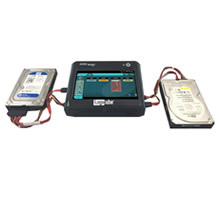 Multi-target CloningClone from 1 or 2 master drives SATA (SAS Optional) to 1 or 2 SATA (SAS Optional) target drives simultaneously. Clone from 1 PCIe master to multiple target drives; 1 USB3, 2 SATA (SAS optional), 1 PCIe, 1 FireWire® (optional). 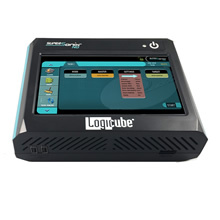 Cloning to/from PCIe drives requires the use of a Logicube PCIe adapter. Clone from 1 USB 3.0 master to multiple target drives; 1 USB 3.0, 2 SATA (SAS optional), 1 FireWire (optional). Use the optional USB to SATA adapter to convert the USB3.0 ports to SATA and clone from up to 3 SATA master drives to 3 SATA targets. PCIe SupportClone PCIe M.2 AHCI or NVMe, PCIe and mini-PCIe express cards using the SuperSonix-NG-P and optional Logicube PCIe adapters. A PCIe Adapter kit (F-ADP-PCIe-T-KT) is available that contains 4 adapters to use with M.2 PCIe, M.2 NVMe, mSATA SSDs and PCIe and mini-PCIe cards. 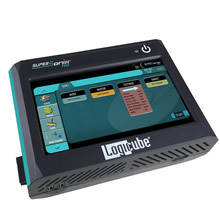 Clone USB Enclosures and Thumb Drives Features 1 USB 3.0 master port and 1 USB 3.0 target port. SAS & FireWire SupportSAS and FireWire drives are supported with an optional software-based activation. Multi-Image MasterStore multiple images created in SuperSonix-NG-P in a repository on a SATA drive or on a USB enclosure connected to the SuperSonix-NG and then clone to selected target drives. Uses can also store multiple SuperSonix-NG created images on a shared network location and then clone to selected targets when the Networking option is purchased. Network Sharing OptionAllows network access (upload/download) to drive images and log files. One Gigabit Ethernet port is available. Provides the ability to clone to/from a network repository. This feature requires the purchase of the Networking Option. Multi-Session CapabilityAllows users to perform multiple tasks including cloning wiping or hashing concurrently. Write-Protected MasterSuperSonix-NG-P master ports are automatically write-blocked to prevent any alteration to sensitive data on the master drive. Wipe FeatureThe SuperSonix-NG-P provides a comprehensive wipe mode. DoD wipe, Secure Erase and custom pass settings. Meets NIST 800-88 guidelines. User selectable option to verify wipe pass value during the wipe process. Error HandingA error granularity user-selectable setting provides more control over error handling of the master drive. Four cluster size settings are provided to determine the number of sectors to be skipped when a bad sector is found on the master drive. Users can also choose to skip bad sectors or abort the cloning operation when bad sectors are encountered on the master drive. Unlock ATA security locked drives Temporarily unlock drives and then clone, hash or wipe. Requires ATA security password to unlock. 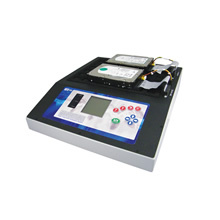 Hash Verification Option Clone and verify the exact replication of the master drive in one single process. Features SHA-1, SHA256 or MD5 algorithms and hash verification is embedded in the audit trail/log file. Requires the purchase of an optional software activation package. Multiple Cloning ModesSupports Mirror (bit for bit copy) and CleverCopy (copies only data areas, skips blank sectors). For multiple partition drives, SuperSonix-NG-P automatically selects the optimum cloning method (Mirror or CleverCopy). Task Macro Allows users to set specific tasks to be performed sequentially. For example, set task 1 to wipe, task 2 to clone, task 3 to hash. FormatsThe SuperSonix-NG formats target drives to NTFS, exFAT, EXT4 or FAT32 file systems and supports cloning from master drives formatted to any major file system. File SystemsSupports all OS and file systems including Linux and Mac® in Mirror mode. Supports FAT16/FAT32/NTFS and Linux (ext, ext2, ext3, ext4) in CleverCopy mode. Remote OperationSuperSonix-NG-P allows you to control all operations from a remote computer using a web browser. Advanced Administrative FunctionsAdministrators can create/manage image repositories and manage network settings (when Networking option is purchased), create user profiles and save configurations. Compact Footprint The SuperSonix-NG-P features a compact size at 7.6″ X 5.5″ X 2.6″ (19cm X 13.9cm X 6.6cm) and weighs only 2.0lbs (1.0kg). Audit Trail/Log Report Detailed information about the cloning session is provided, and reports can be printed from a browser. Report includes a digital signature for authentication purposes. Reports are available in PDF, HTML or XML format and users can export individual or all log reports to a USB flash drive. USB 2.0 Host Ports The unit features two USB 2.0 ports for connecting a keyboard and mouse as well as an HDMI port for connection to a monitor. HPA/DCOClone or wipe HPA/DCO areas of the drive. Color Touch Screen DisplayA vibrant display provides an intuitive and easy to use interface. User Manual The user manual is available via a QR code clickable link within the user interface on SuperSonix-NG-P. 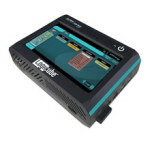 One-year Standard WarrantyThe SuperSonix-NG-P hard drive duplicator comes complete with a one year parts and labor warranty. Both an optional 1 year extended warranty (total of 2 years) and a 2 year extended warranty (total of 3 years) are available. Software options can be purchased at the time of the purchase of the SuperSonix-NG or post-sale. Contact our sales team for information. FireWire/MAC OptionSoftware option enables FireWire master and target ports activation. Provides the ability to clone from a MAC in target mode. Includes 1 FW cable. An off-the-shelf Thunderbolt to FW cable is required for MACs with a Thunderbolt port. Verification/Hash software option. 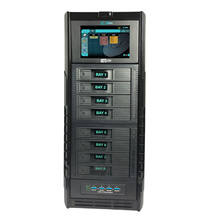 Allows the user to clone and verify the exact replication of the master drive in one single process. Features user-selectable SHA-1, SHA256 or MD5 algorithms. The hash verification is embedded in the audit trail/log report. Software option enables FireWire master and target ports activation. Provides the ability to clone from a MAC in target mode. Includes 1 FW cable. An off-the-shelf Thunderbolt to FW cable is required for MACs with a Thunderbolt port.